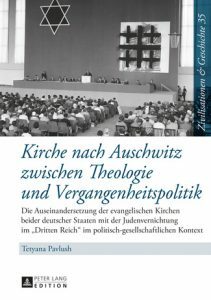 Review of Tetyana Pavlush, Kirche nach Auschwitz zwischen Theologie und Vergangenheitspolitik: Die Auseinandersetzung der evangelischen Kirchen beider deutscher Staaten mit der Judenvernichtung im “Dritten Reich” im politsch-gesellschaftlichen Kontext (Frankfurt: Peter Lang Edition, 2015). Pp. 573. ISBN: 9783631656655. This book (the author’s 2014 dissertation at the Freie Universitat in Berlin) examines how the Holocaust and its legacy were addressed between 1945 and 1989 by Protestant church leaders, journalists, laypeople, and theologians in the German Democratic Republic (GDR) and the Federal Republic of Germany (FRG). It is an ambitious work that traces church and public discourses about the Holocaust, antisemitism, Jewish-Christian relations, post-Holocaust theology, the Israeli-Palestinian conflict, and issues of memorialization, in conjunction with the major events and anniversaries that raised public awareness of these issues and often provoked national debates. The Cold War issues always lurk in the background. Pavlush focuses primarily on four events: the 1961 trial of Adolf Eichmann and the wave of antisemitism that swept Germany around the same time; the controversy about Rolf Hochhuth’s 1963 play Der Stellvertreter (The Deputy); the 1967 Six-Day War; and the 1979 national broadcast in the FRG of the U.S. television docudrama The Holocaust. In a separate chapter she examines the 1968, 1978, and 1988 anniversaries of the November 9 pogroms (“Kristallnacht”) as indicators of how East and West Germans viewed their history. She sets her discussion of these events within a larger framework that draws on three intersecting levels of analysis to trace how German Protestants in general addressed their past throughout this period. The first level is a comparison between public and church conversations about the Nazi past and the Holocaust in the GDR and FRG. The second charts the chronological course of Vergangenheitsbewältigung (the process of dealing with the past) over the decades as evinced by the aforementioned controversies and responses to them. Here she examines how the public discourses in East and West changed over time as measured by specific events (this is best illustrated by her comparisons between the different “Kristallnacht” anniversaries). The third examines how international events, such as the Eichmann trial, the Israeli-Palestinian conflict, and the Vietnam war, influenced church and public conversations about Germany’s past and its contemporary obligations. Clearly, any one of these topics would suffice as a dissertation topic, and the scope and complexity of this work is simultaneously its strength and weakness. In many ways this is a masterful survey of the major postwar controversies and developments over the decades as Germans addressed their past. It illustrates how engaged the Protestant churches were in this process. There is a wealth of background information and documentation, the events she has selected were indeed turning points, and she gives helpful context to the various debates. Juggling so many events, time periods, and underlying narrative currents, however, makes for an extraordinary level of complexity, and Pavlush navigates this complexity more successfully in some places than in others. She does a fine job of tracking and contextualizing the different discourses in East and West, and this may be the book’s most valuable contribution. From the beginning, the two postwar German states defined their relationship to the Nazi past differently. Aligned with the eastern bloc, the GDR became tied to Soviet narratives that emphasized anti-fascist and Communist opposition to the Third Reich. National Socialism was portrayed as a capitalist phenomenon, and the issues of antisemitism and the genocide of the European Jews were seldom addressed. Although there was a small Jewish population in the East (and her account of the role of Jewish leaders in the GDR is fascinating), Jewish-Christian dialogue existed only to a limited degree, whereas it quickly developed a visible and importantly symbolic function in the west. Throughout its history the GDR never established diplomatic relations with the state of Israel. As Pavlush notes, this reality led to an “asymmetrical” dynamic between East and West: there was a lot more going on in the FDR than in the GDR. As a parliamentary democracy firmly anchored in the West, the FRG quickly assumed the mantel of responsibility in the international arena for addressing the past through reparations, war crimes trials, and relations with Israel. By the early 1950s, there was a public square in the FRG in which the Nazi past had become a constant point of reference for international and domestic issues. What Germans understood by the very concept of “the Nazi past” varied greatly, however, particularly in the 1950s and 1960s. Public opinion polls in the late 1940s showed that almost 40% of Germans retained antisemitic attitudes, and there were outbursts of antisemitic violence. The EKD’s 1945 Stuttgart declaration made no direct reference to the murders of the Jews. The Württemburg Society’s 1946 declaration and the April 1948 declaration of guilt toward the Jewish people by the church of Saxony were the earliest church attempts to address the Holocaust explicitly. Like the EKD’s 1948 Wort zur Judenfrage, these statements offer a snapshot of the theological challenges and the political difficulties of the time. There was a general failure to address church complicity and acknowledge the relationship between Christian theological teachings about Judaism and Nazi antisemitism, and the persecution of the Jews was often conflated with general postwar German suffering. Moreover, many of the leading Protestant figures in the postwar era had historical baggage of their own. In their responses to postwar controversies, they sought to justify their role before 1945 and place themselves on the right side of postwar history, as can be seen in the often opposing political positions taken by figures like Eugen Gerstenmaier, Otto Dibelius, Lothar Kreyssig, Martin Niemoeller, and Helmut Gollwitzer. Events like the Eichmann trial and the Hochhuth play became litmus tests for competing versions of history. One of the advantages of studying a forty-year period is that the differences between the different generations of prominent Protestants become evident. Pavlush delineates three clear generations, driven by different life experiences, postwar agendas and worldviews: those who were already active in or had begun their careers by the 1930s; those born during the late 1920s and early 1930s, who came of age during the Nazi era (Johann Baptist Metz, Jürgen Moltmann, and Dorothee Soelle), and the third generation, born during the late 1930s or 1940s (Bertold Klappert, Peter von der Osten-Sacken), who were still children in 1945. Many in the second generation turned critically against the first, often not only historically but politically in terms of Cold War issues. The last generation was the one that became most engaged in Jewish-Christian dialogue. She also examines the role of the different Jewish leaders on both sides of the border who engaged with Protestants about these issues: Siegmund Rotstein, Robert Raphael Geis, Eugen Gollomb, Nathan Levinson, and Edna Brocke. The first Jewish-Christian organizations began quite early, often founded by those who had been engaged in rescue or resistance activities before 1945. In 1949 the German Koordinationsrates der Juden und Christen was founded, and during the 1950s groups for Jewish-Christian cooperation emerged in the major cities. The three German organizations for Judenmission, which had been dissolved during the Third Reich, reconstituted themselves as well, and so another ongoing tension in the German discussion was between those engaged in dialogue with Jews and those who wanted to revive Protestant efforts to evangelize and convert Jews. In 1958 Lothar Kreyssig, a judge and Confessing Church layman who had attempted to halt the euthanasia program, founded Action Reconciliation (Aktion Sühnezeichen) under the auspices of the EKD. The organization began to send young Germans to serve in countries that had been occupied by the Nazis, and the first AS volunteer to Israel arrived after the Eichmann trial. By this time there were some striking differences between the FRG and the GDR. Young East Germans couldn’t get visas for the Aktion Sühnezeichen trips, for example. Yet the 1961 Kirchentag (which convened in the early summer before the construction of the Berlin Wall in August; it was the last Kirchentag that East and West Germans celebrated jointly until 1991) helped spur a new phase of Jewish-Christian engagement in both Germanys. Dusseldorf Rabbi Robert Raphael Geis gave the keynote address. The EKD working group on “Jews and Christians” (Arbeitsgemeinschaft ‘Juden und Christen’) was founded at the 1961 Kirchentag, as a sign of the churches’ commitment to fostering Jewish-Christian relations. Pavlush’s discussion of the emergence of Jewish-Christian relationships and the related church statements is the most uneven aspect of the work. That’s partly because of how the book is structured; many of the seminal statements on Jewish-Christian relations were direct responses to the events she discusses separately in other chapters. Hence, her treatment of this issue is scattered across the different chapters and interwoven with other topics without a clear transition from one point to another. Sometimes there’s not even a clear chronology. She deals in a single paragraph, for example, with the national EKD study commission on Kirche und Judentum in 1967, its 1975 study, the 1981 Rhineland synod, and the 1965 establishment of the Institut für die Erforschung der Geschichte der Juden in Deutschland in Hamburg. Rather than going into detail about the genesis of these developments and the ways in which they addressed the past and contemporary issues, she then discusses Nostra Aetate before giving a brief overview of how the Middle East conflict affected Jewish-Christian dialogue in the GDR. Among other things, this book could really use an index. The other problem is the blurring of lines between Catholic and Protestant issues and responses. Although this book is ostensibly about the Protestant churches, the author ventures into issues that were far more significant for the Catholic church (such as Nostra Aetate and the Hochhuth play), and she also refers to some of the Catholic Jewish-Christian circles and statements. This adds another thread of complexity to an already complex work, although it does illustrate the extent to which these events drew reactions from both churches. The primary example is her discussion of Rolf Hochhuth’s 1963 play The Deputy, which provoked a firestorm because of its critical portrayal of Pope Pius XII. Because of the considerable public debate and widespread media coverage of Hochhuth, one can make the case that Protestant reactions give some insight into the public discourse about Nazi history at the time. Some Protestant observers viewed the play as a broader critique on both the Catholic and Protestant churches. In the GDR, Hochhuth’s condemnation of the Pope was seen as part of a deeper critique against fascism and the West. In its timing, the play coincided with (and perhaps helped provoke) the beginnings of the attacks on the legends of the Church Struggle. Certainly this was how figures like Otto Dibelius viewed it; he attacked Hochhuth for a “cheap and highly naïve version of history.” As in so many other postwar events, the dividing lines from the era of the Protestant Church Struggle reappeared. In contrast to Dibelius, Helmut Gollwitzer and Gunther Harder supported Hochhuth’s critique of the Pope, extending it to the Protestant churches as well. The 1961 trial of Adolf Eichmann in Jerusalem was another major turning point. In 1959/60 there had been a wave of antisemitic violence, which led the churches to issue statements condemning antisemitism. While many of the EKD leaders spoke out (Otto Dibelius, who was chair of the EKD council at the time, sent a telegram of solidarity to Ben Gurion in Israel) Pavlush observes that the substance of the statements didn’t really go beyond what had been said at the 1950 Weissensee synod. Yet the trial itself demanded and provoked a rawer engagement with the past. It aroused special interest among Protestant leaders because the only non-Jewish German witness was Heinrich Grüber, who had led the Confessing Church’s office to help “non-Aryans” (most but not all of them baptized Christians). In that capacity Grüber had dealt with Eichmann directly. In a church newspaper before the trial, Grüber wrote memorably that “it was only the ‘Hitler in us’ that gave power to the ‘Hitler over us’” and urged the German press to report on the trial in a way that would help German readers to feel a personal connection to what had happened in the Holocaust. Grüber used the trial as the occasion to confront his fellow Germans, noting the number of Nazis who had found their way into prominent postwar positions, and he charged EKD leaders with the failure of repudiating their earlier antisemitic statements. He also warned that the trial could be misused in the Cold War context to awaken tensions between the two German states—and was criticized by East Germans as a consequence. Pavlush examines the reactions on both sides of the German border, as well as perspectives of the Israeli audience, including Holocaust survivors, for whom Grüber’s testimony often seemed defensive and an attempt at apologia. The trial compelled Germans to take a position about their past and their German identity in the contemporary world. The 1967 Six-Day war was another such occasion. Pavlush contextualizes it in the broader landscape of the 1960s, which included the student rebellions, the Vietnam War, the beginnings of a more critical view of the German churches record under Nazism, and the emergence of a new generation of political theologians like Dorothee Soelle who applied the lessons of the Holocaust to the burning issues of the 1960s. This chapter offers a good discussion of the theological and political debates of that era. The Cold War realities and alliances shaped perspectives in East and West toward the state of Israel, which in turn affected how Protestants viewed the agenda for Jewish-Christian relations. Here too there were generational and political divides. Some from the first generation of Church Struggle veterans viewed solidarity with Israel as a necessary moral position for postwar Germans; others were critical of the West and Israel. The mood in the GDR was largely anti-Zionist, although there were isolated voices in the GDR churches that called for greater balance on the issues and supported Israel’s right to defend itself. The final example, the 1979 nationwide broadcast of Holocaust, was another turning point in the West. Yet unlike the Eichmann trial and the Hochhuth play, it didn’t trigger a similar widespread discussion in the GDR. It was broadcast only in the FRG, of course, but as Pavlush notes, it is striking that East Germans didn’t seem to follow or engage with the intense press debates and coverage in the West. Once again, however, the broadcast coincided with other events to spur a new wave of discussion about the past. In the decade that followed in the FRG, there was a growing number of forums and conferences at the church academies, new and more critical scholarship on the role of the churches during the Nazi era, and civic initiatives around the country in which local communities began to examine their history. A related development was the 17-page 1978 EKD study, Zur Verfolgung des Judentums durch den Nationalsozialismus, which traced not only the church’s record between 1933 and 1945, but critically examined how the Protestant church had interpreted (and sometimes misconstrued) that history after 1945 – for example, by conflating the suffering of the Jews with that of postwar Germans and by politicizing the Kristallnacht commemorations. Pavlush’s book illustrates that the process of theological and political Vergangenheitsbewältigung was shaped by numerous factors over the decades between 1945 and 1989, and she shows how often the attempts to address the Nazi past became part of contemporary political agendas. Ironically, the photograph on the book cover itself highlights the complexity of the issues that confronted postwar churches. It shows the main stage at the Jewish-Christian dialogue session at the 1961 Kirchentag, with the Star of David and the Kirchentag symbols prominently displayed. Then and now, the Protestant Kirchentag symbol consists of a large central cross surrounded by four smaller crosses in each quadrant—virtually identical to the symbol of the Romanian Iron Guard, an antisemitic clerico-fascist group that sought to merge Orthodox Christianity and fascism during the 1920s and 1930s. Its adoption as the Kirchentag logo was no doubt unintentional, but it’s unlikely that this went completely unnoticed by Jewish and international visitors (one of my colleagues at the Holocaust Museum immediately asked me about it). Over seventy years after the defeat of Nazi Germany, the historical minefields continue to exist. Note: The views expressed in this review are those of the author and do not necessarily represent those of the United States Holocaust Memorial Museum or any other organization.